Miami Yovo DVD Now Available for Pre-Order! THIS IS THE ONE! A STAGE, DANCE AND LIGHTING PHENOMENON! Yerachmiel Begun brings us the DVD of the ALL-NEW MIAMI EXPERIENCE – MIAMI YAVOH. 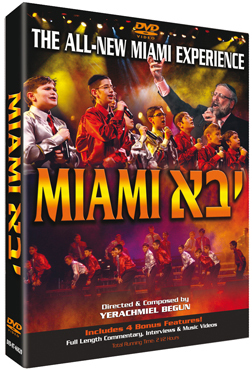 Coming off the very popular YAVOH album, this DVD is easily the BEST MIAMI DVD EVER, and possibly, the best concert DVD ever on the Jewish market. Shot in HD with a 10 camera team, it beautifully captures the amazing new MIAMI performance that has become the talk of Jewish music. MIAMI roams the stage with their new technological advance microphone system. MIAMI’S superior vocals, performance and ground breaking choreography and dance are second to none. Enhanced by a startling Lighting show, MIAMI YAVOH is an exhilarating visual experience; a DVD that will take your breath away. The DVD also includes 4 amazing bonus features; including 2 new music videos, an interview with choir members, and for the first time, a full length commentary on the entire dvd. Running time 2 1/2 hours. Pre-Order now and save $2! This will be the DVD that will set the bar for other Music show DVD’s. Order your copy now – THIS IS THE ONE! For Chanukah and Beyond.